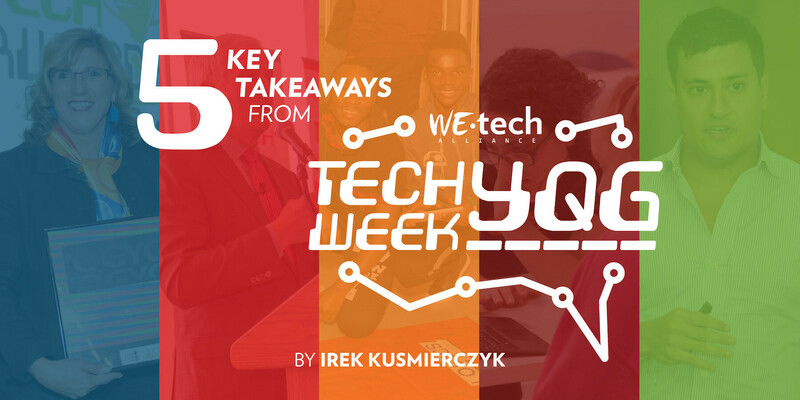 This year’s amazing Tech Week YQG packed fifteen events in five days! Here are five takeaways to share with your friends and co-workers. It didn’t take long for the joint Windsor-Detroit bid for Amazon HQ2 to pay dividends. 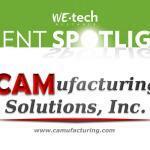 Matt Cullen – Principal of Rock Ventures – headlined Tuesday’s Tech Show the week after Quicken Loans announced they were moving into the old fish market with 100 tech jobs in tow. Cullen talked about the “insatiable appetite for talent” of the 100 companies under the Rock Ventures portfolio headed by billionaire entrepreneur Dan Gilbert – companies like Quicken Loans that under a decade have brought 17,000 workers to downtown Detroit representing diverse talent from 140 countries as the city transitioned “from a brawn economy, to a brain economy”. Windsor is that near-abroad which provides Rock Ventures both a new talent pool and a gateway to tech talent from London, Waterloo and Toronto, leading to the obvious question: how long do you think it’ll take Blackberry folks to learn to pronounce Pierre? Detroit is the 9th fastest growing tech scene in the country, says Kimberly Driscoll of Grand Circus, a for-profit organization that trains people to code. Grand Circus has graduated 1,200 developers since 2014, helping to fuel the rise of local tech companies, but even still Detroit has the 6th highest gap in demand-vs-supply in tech talent. By 2020 – there will be 1 million tech jobs across the United States that will go unfilled for a lack of talent – and that is why the search for fresh pools of talent is so critical to sustaining our region’s ascent. Of its coding graduates at Grand Circus – 41 per cent are women and 30 per cent are minorities, segments of the population drastically underrepresented in tech. Wednesday’s Tech Talent Day focused its sights on that very challenge. Tech Talent Day at St. Clair College brought 250 high school students for a hands-on introduction to e-gaming, robotics and coding and the opportunity to spark an interest in tech career paths. Meanwhile, the University of Windsor EPICentre hosted the Ontario Chamber of Commerce Vice-President, Louie DiPalma, who introduced the Discover Ability Network which connects employers with people with disabilities. As a Forbes magazine succinctly put it, “people with disabilities represent an almost untapped talent pool who bring a wide range of education, experience, expertise ….” (July 30, 2015). The following day was dedicated to Tech Women with a learning-to-code workshop that introduced professional women and students to HTML and CSS. When the three best story-tellers from Windsor and Detroit tell you that narrative matters – like, a lot – it’s best to listen. Nick Shields and Cameron Hucker from Windsor-based Suede Productions, and Dennis Archer Jr. from Ignition Media Group and former Chair of the Detroit Regional Chamber of Commerce, emphasized the need for a concerted public relations effort and synch-storytelling to craft and control an authentic narrative around Windsor and Detroit – or others will do that for us. 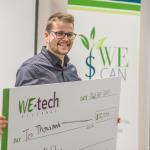 Here’s one example of doing it right – the third iteration of a series of videos produced by three local companies – CenterLine, Brave Controls and Next Dimension – aimed at attracting tech talent to Windsor-Essex, which was unveiled at Monday’s Tech Launch. And here’s a copy of the Amazon HQ2 video Move Here, Move the World. What will attract talent to Detroit and Windsor is transportation + housing + jobs + hospitality + livability – and that takes cooperation. According to Cullen, Detroit’s comeback is driven by community leadership that is “fully aligned and fully in-synch” across political + business + philanthropic + neighbourhood + civic. There didn’t appear to be a choice, he says, since “we don’t have the luxury of being inefficient in our deployment of our resources so we have to be collaborative”. In came the realization that the “public space is a huge deal” where people can engage people in places like Campus Martius or The Belt. Cullen highlights the Detroit Riverfront Conservancy helping to leverage $2 billion in riverfront investments that have transformed GM Plaza, Gabriel Richard Park, Cullen Plaza, Atwater Beach, and others along a five-mile strip. It’s why Archer Jr. highlights the importance of Detroit’s food scene, with 27 new restaurants opened in 2017 alone – including Archer Jr.’s own Central Kitchen. Of equal importance is not the destination but our mode of travel – with Mark de la Vergne, the Chief of Mobility Innovation at the City of Detroit, leading the revolution. Be it autonomous shuttle pilots, electric car sharing or the launch of 600 dockless e-scooters and the Q-Line – the Motor City is embracing Mobility City. The best PR in the world can only take you so far – at a certain point you have to do it. Tech Week YQG came full circle when Salvador Salaga from Michelin North America took the stage – emphasizing the need for perpetual innovation and reinvention of a 130-year-old company that employs 114,000 employees, produces 190,000,000 tires annually and nets $33 billion in sales. It’s one reason Michelin sponsors the world’s largest summit on sustainable mobility – Movin’On – that will bring 5,000 participants to Montreal in June, 2019. The next speaker – Nico Probst from Lime, an upstart company from Silicon Valley that is the leading first-mile-and-last-mile transportation solutions through the deployment of dockless e-scooters and e-bikes – provided an interesting contrast. Like Michelin tires, scooters have also been around for over 100 years, but it is their innovative dockless deployment that is revolutionizing mobility and reducing the need for autos. Citizens can pick up a scooter that they find via a mobile app, and drop them whenever and wherever they want. Probst states that “the use rate is astronomical” with some cities like Portland averaging 14 rides per scooter per day. Waterloo launched a limited pilot project in the summer of 2018 and within a month had registered 12,000 rides. Micromobility is one reason why in some cities ride-sharing companies like Uber have seen a 40 per cent decrease, as disrupters are themselves being disrupted by mobility. Sharing the stage with Michelin and Lime were five Ontario mobility start-up companies taking part in the Mobility Pitch Challenge with the winners – Optimotive (Windsor) and Joyride (Toronto) – splitting the $10,000 prize pool and the experience of seeing two companies with successful roadmaps to market. Tech Week YQG concluded with a challenge – to dream big with our sleeves rolled up® – and the realization that the pieces are already here to grow a vibrant cross-border tech cluster.